I'm going to tell you something you already know: Dale Earnhardt Jr. is a rock star in NASCAR. But despite being the most popular and most endorsed/highly paid driver in the sport, Dale Jr. doesn't seem to publicly embrace his rock star status much. He's usually mild-mannered and soft spoken in pre- and post-race interviews. He doesn't do social media or go out of his way to get attention--you never read about him in tabloids or gossip websites. And even when I've seen him out and about around Charlotte, he's usually low-key and not rolling with a large entourage. Yet, he's always in your face because he doesn't shy away from lucrative product and brand endorsements, and launching his own ventures like potato chips, nightclubs (Whisky River is opening a location soon at Charlotte-Douglas International Airport), and Earnhardt Outdoors with his siblings (which is currently asking for your ideas for new outdoor products, like for hunting, fishing, camping, etc.). Finally, of all the television commercials Dale Jr. has appeared in, his new one for Mountain Dew showcases his rock star lifestyle. The "Living Portrait of Dale Earnhardt Jr." commercial started airing on TV at the beginning of the month, and I saw it repeatedly over the weekend. It's the latest promotion in Mountain Dew's "This Is How We Dew" campaign, which this installment features moving "portraits" of three of the soda brand's celebrity endorsers. The other two guys featured are snowboarder Danny Davis and skateboarder Paul Rodriguez. You can see all three commercials at mountaindew.com/portraits. Dale Jr.'s living portrait shows him sitting in victory lane on a throne made of engine parts, surrounded by members of his pit crew (not sure if those are the actual pit guys) who are spraying Mountain Dew in the air in celebration, along with hot chicks waving checkered flags and country music star Brantley Gilbert jamming away on his guitar (though that's not his music you hear playing). In the background, you'll also notice his No. 88 car, the Whisky River logo, lights and seating from a racetrack, and two people doing stunts on four-wheelers (not sure of the tie-in with that part). It's an all-around cool, 30-second ad, including the use of the song "Hot Fire" by Crash Kings. But as several commenters on the YouTube video have pointed out, and I certainly agree with, the concept of the commercial looks a lot like the visual techniques used in Kanye West's 2010 video for "Power" (See, another reason why Ye is the greatest of all-time. #KanyeVoice). 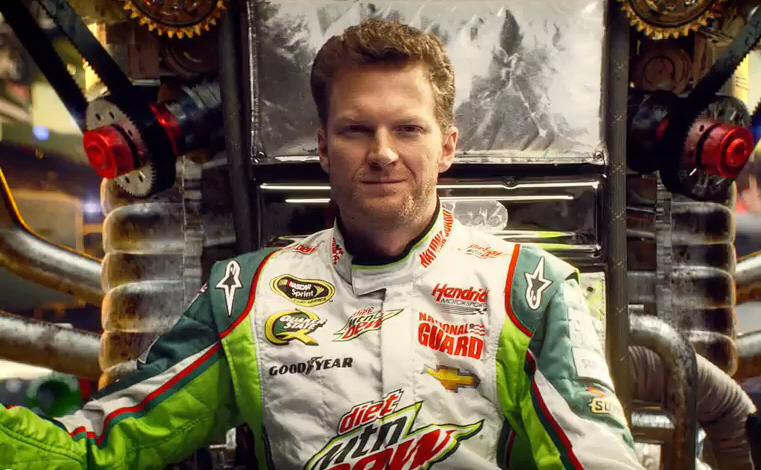 Unfortunately, the commercial strays a little from Dale Jr.'s reputation, by virtue of facts. The visual is set in victory lane at a racetrack, as I pointed out. But if you follow NASCAR, then you know that Junior has won only one NASCAR Sprint Cup series race in the last five years, and that victory came more than a year ago in June 2012 (that's one win in about 200 races). By comparison, his Hendrick Motorsports teammate Jimmie Johnson has won four races this season alone. In terms of the standings, Dale Jr.'s had a pretty good season, currently ranked seventh and with five top-five finishes. With only two races remaining in the regular season schedule, he's almost a shoe-in to make the Chase, NASCAR's playoffs. Win or lose, he's still a rock star. In other Dale Jr. news, he'll appear on the next episode of Fast N' Loud on Discovery. The show is about a couple of car experts who go around the country searching for rare classic cars to restore. Dale Jr. is a known car buff, so I assume in the episode, which airs on Monday, September 2, at 9 p.m., that we'll see the show's crew coming to Dale Jr.'s Mooresville home and/or race shop to get one of his cars.